This is a good start but just needs a bit more attention paid to formatting. For example, using tabs for the separate classes would help people go directly to the class they're interested in instead of having to scroll a long way. The first couple of sections should use lists (ordered and unordered) and links should be named rather than having the whole URL pasted. Any idea what the 11th armor rack in the Hunter Order Hall is for? It is next to the door across from X'era. Thank you. I not even notice about it. I know I've run the Tier 4 and 5 raids enough to have accumulated the tokens at least three times over, but it's likely that I didn't turn them in for the same spec. It's also possible I might've missed turning one in over and over. Is there a way that I can find out what specific pieces I already *have* received and what spec they were for? I'll bet I'm only missing a single one for at least 4 of these sets. It isn't specified in your guide, but according to comments in the Reddit post you linked, for tier 9 you want the 10 Man version (which you can purchase for gold in Old Dalaran). I can confirm that this is correct. For tier 10 you want the ilvl 264 version, which is obtained by upgrading the ilvl 251 items (which can be purchased for gold in Old Dalaran) with tokens obtained from 25 Man ICC. fwiw, you don't have to wait for the refund timer to expire to keep the appearance, you can simply drag the item out of inventory and destroy it. This may seem like a dumb question so I apologize but I don't have any of the racks filled yet since I didn't keep any of these sets. Do the racks fill up in order of completion, or does each rack fill with a specific set of armor. For example, does the 1st rack always use Tier 1, or just the first set you complete? I could be mistaken, but I don't think the armor racks unlock until you're 110. I repossessed a set (I cleared out my void storage after wardrobe came in) and it's not showing in my order hall, but I'm only 108 currently on my highest toon. I can confirm the Deathknights use Tiers 7-16 as I have tiers 11 and 12 displayed. New section! Complete Armor Racks! If you've finished your halls collection, send the best picture you can get of them and I'll add it with credits! One thing I've wondered about the display is whether it includes weapons also. 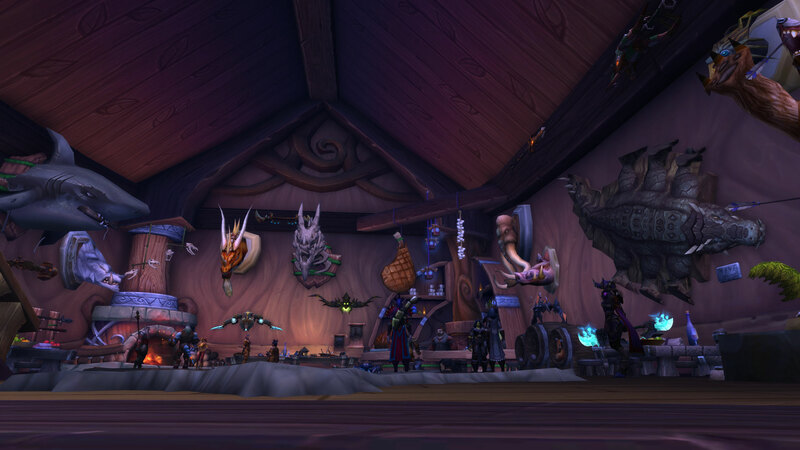 When you go in the Hunter class hall, there are a lot of weapons on display, particularly when you turn left after entering as the screenshot below shows. It includes some of the rarer and more interesting weapons including the legendary bow. Since they are all weapons my hunter actually has, I'm not sure if it is a display of weapons taken from the hunter's actual collected weapons, or if it's just a a general display of weapons a hunter might be able to have. None of the ones in my display are ones I don't have though so I wouldn't know without seeing what it looks like for another hunter. If another hunter who doesn't have the legendary bow sees it displayed up on their wall then it would let us know one way or the other. For most classes, you can buy the tier 9 and 10 sets for gold from a vendor and have them displayed. For the death knight though, you can also buy the tier 11 and 12 sets for gold from a vendor in Stormwind or Orgrimar. 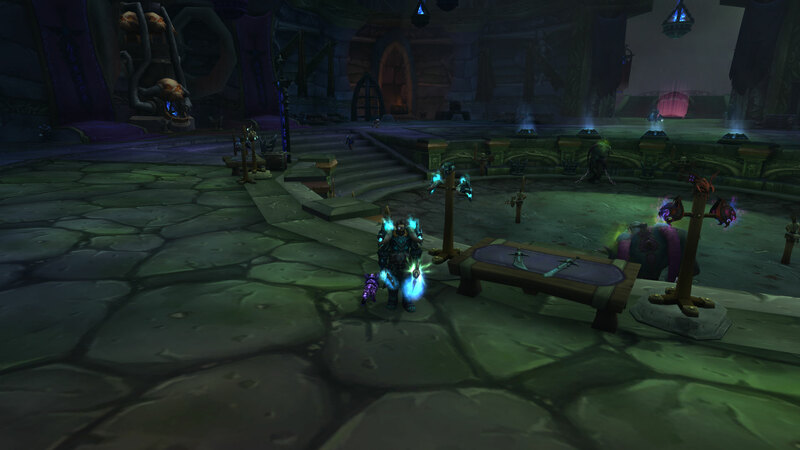 That means that a Death knight can quickly get 4 sets displayed on their racks without setting foot in a raid as displayed in the screenshot below. 4: You DO have to OWN the items. This means that once you turn in an armor token that you have to wait for the refund timer to expire. OR cheat it by throwing them into void storage, which will make them unrefundable. I have collected many pieces but once I had the appearance I disenchanted them straight away. Does this not count? Do I have to buy them again and wait for the timer? I purchased the entire T9 set for hunters from the vendor in old Dalaran, and i let the timer run out on the refund, but the armor set still hasn't shown up on my armor rack. thoughts? Those tier sets didnt even have multiple spec variants for hunters so it was definitely all from one set. You should probably call the Northrend version of Dalaran "Intermediate Dalaran" not "Old Dalaran", since mages have a portal to old dalaran that does not take you to Northrend, it takes you to Hillsbrad. Very much appreciated. Shall now go and collect all my alts' stuffs. . Thought the full arc was too zoomed out so I added the two close ups. You don't need all eight pieces for at least T4 and T5. I'm not sure which ones you actually need all eight pieces for, if any of them. It looks like the T16 (SoO) Sets need to be from the original Normal, now Heroic version, not the current Normal, formerly flex. The set didn't show up on my racks until I got the full 553 set from current Heroic SoO. Looks like Shaman valorous worldbreaker - 10m Ulduar , doesn't show on rack. Is complete in the set , and all pieces from same spec, but just not there. 2. If you have a second char of the same class as a char that has already collected the tiers, then it counts for the other char as well. For example: I have a 110 hunter who has all 10 sets in the hall; she owns all the pieces. My 98 hunter who just went to the class hall, can also see all 10 sets displayed, even though she only has a couple of the Tier 1 bits in her bank. This may change in the future, but for now you don't have to grind all the sets on all your alts or necessarily go and re-get bits you've collected, put in the mog book, and then deleted pre-patch 7.0. Finished up the Druid ones today, here's what the complete set looks like. I think it's a real pity it only shows helm and shoulders. Would of been so much better with the full sets on display. You don't need the full set of Tiers 9 and 10 for it to be displayed. I don't have the full set for Bloodmage's Regalia or Khadgar's Regalia of Conquest, but both are on display in my OH. Maybe you only need 5 pieces of those sets for them to be displayed. For Shaman T6 you have to collect all pieces within the set list. Some of the pieces appearance don't math the blue storm themed armor. I have my Tier 6 on display, yet I haven't picked up the boots yet. Not sure what the criteria is for allowing the tier to display. Really helpful guide. Thanks so much for this, especially the CanIMogIT explanation and tips on actual ownership vs. just holding something in your bag. Yesterday I ran BT and Sunwell and got all eight t6 pieces. The rack is still empty. do I need to complete the xmog aswell?